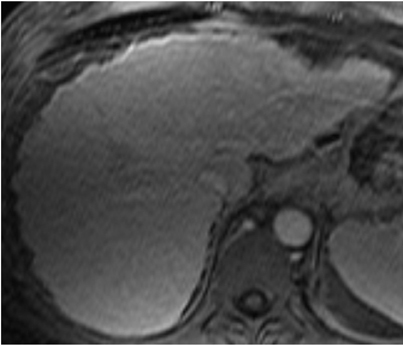 The cirrhotic liver provides a challenging background for the detection of hepatocellular carcinoma (HCC).1,2 Although MRI is the most accurate imaging method for the detection and characterization of HCC, all imaging techniques may fail to detect small HCCs.3 There is now broad agreement that in cirrhosis, there is a stepwise progression from regenerative nodules (RN) to HCCs along the following pathway: RN, low-grade dysplastic nodule (DN), high-grade dysplastic nodule (DN), and HCC.4,5 An important caveat in this pathway is that most RNs do not progress to DNs and, although DNs are considered premalignant lesions, they may remain stable or even regress without evolving into HCCs. Progressive change in the lesion’s blood supply, with a corresponding increase in its arterial supply relative to its portal supply. This arterial neovascularization underlies the early arterial phase enhancement and portal venous phase washout pattern characteristic of HCC. In addition, benign lesions may be present, confounding imaging interpretation. 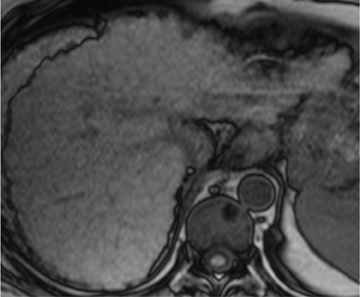 Noncontrast imaging is valuable for assessing diffuse hepatic changes, such as fat infiltration and iron deposition, and focal changes such as subtle calcification and hemorrhage.9 However, CT and MRI allow multiphasic postintravenous (IV) contrast imaging, which facilitates detection and characterization of focal liver lesions and is widely used for this purpose. Multiple phases may be obtained during contrast enhancement; these may include early and late arterial phases, as well as portal and equilibrium phases. Protocol optimization and optimal timing of the post contrast phases maximizes the lesion-to-liver contrast. The minimum requirement for liver imaging is an arterial phase (20–40 sec postcontrast injection) and a portal venous phase (60–80 sec postcontrast injection).1,2,12 Many systems allow direct triggering of the acquisition by observing contrast medium arrival in the aorta; this approach provides more consistent results. 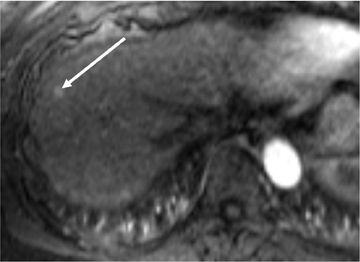 MRI has a wider range of contrast mechanisms than CT. A broad range of liver MRI protocols is possible due to the numerous combinations of field strength, pulse sequence implementation, and interdependent sequence parameters available.13-17 Comprehensive liver imaging using MRI now includes T2- and in- and opposed-phase T1-weighted imaging, in addition to dynamic post-contrast imaging. DN may appear identical to RNs and HCCs on MRI and CT imaging (Figure 4). In DNs, all of the usual cellular components of normal liver parenchyma (hepatocytes, Kupffer cells, and biliary ducts) are still found.4 DNs may be divided into low-, moderate-, and high-grade DNs.4 A feature that distinguishes them from RNs is early arterial neovascularization, most prominent in the high-grade nodules. Although DNs may have any signal intensity on T1-weighted images, fat accumulation can be present and can be detected using in- and opposed-phase T1-weighted images.19,20 On T2W images, DNs are usually iso- or hypointense compared to the liver parenchyma. Because of some degree of neovascularization, DNs may show early homogeneous arterial enhancement similar to HCC following IV contrast administration, although they generally do not show washout in the delayed phases.19,20 Like RNs, DNs are usually smaller than 2 cm. Hepatocellular carcinomas may exhibit a spectrum of CT and MR imaging characteristics, in part related to their variable degree of differentiation. Well-differentiated HCCs still exhibit some cellular similarity to hepatocytes, and thus retain some degree of hepatocellular function, whereas in poorly differentiated HCC, hepatocellular function is lost.1-5,9,19,21 In addition, areas of hemorrhage or focal fat can be present within HCCs, leading to variable imaging features (Figure 5). At noncontrast CT imaging, HCCs can be hypo-, iso- or hyperdense compared to liver parenchyma. HCCs are usually hypointense on T1W images, but they can be iso- or hyperintense. Fat is rarely present in HCCs, but like fat-containing benign lesions, it can be demonstrated using in- and opposed-phase T1W images. HCCs typically show mild increased SI on T2W images because of inflammation, edema and necrosis within the lesion (Figure 6). Despite this hyperintensity, differentiation from the surrounding liver parenchyma on T2W imaging can still be difficult, given the possibility of motion and other artifacts, as well as possibly altered T2 signal within the liver parenchyma itself. Furthermore, HCCs with low signal on T2W imaging have been described. Liver resection and transplantation represent the only curative treatments for HCC. Forms of ablative treatments, which are not curative, include trans-arterial chemo-embolization (TACE), trans-arterial embolization (TAE), radiofrequency ablation (RFA), cryoablation, and Yttrium-90 radio-embolization. These ablative techniques induce tumor necrosis. 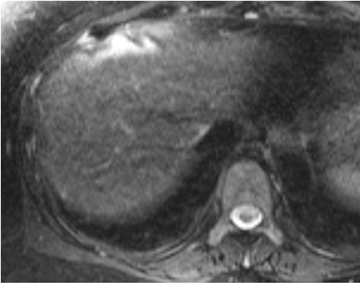 28,29 CT and MRI may be used to assess therapy success by discerning between viable and necrotic HCC. Because the treatment targets HCC vascularization, a successfully treated necrotic HCC will not enhance following IV contrast administration.28,29 At MRI, to assess the presence of post-contrast enhancement, subtraction images can be useful, given the possibility of increased signal in the lesion on precontrast T1W sequences related to the therapy (Figure 12). In addition, apparent diffusion coefficient (ADC) maps calculated from DWI, can be useful to quantify changes in HCCs following treatment.21,30 For instance, in one study, HCC that responded to chemo-embolization demonstrated an increase in ADC values following treatment.31 It is important to be aware of factors that can confound assessment for treatment response. Following ablation, especially within the first 30 days, an enhancing rim consisting of granulation tissue can surround an HCC that is in fact completely necrotic.28,29 In addition, benign reactive areas of abnormal arterial enhancement can be present in the treated lobe following treatment; such regions may be recognized by the lack of washout in the delayed phase. CT has also occupied a particular role following selective hepatic arterial injection using Lipiodol; this agent is usually cleared from normal liver parenchyma within 7 to 10 days, upon which CT may be performed to assess for any lesions retaining the agent, which would indicate areas of tumor. Finally, follow-up of HCC treated using pharmacological therapy with sorafenib is performed via size criteria. MR, CT, and ultrasound imaging represent an essential tool in the detection and characterization of liver lesions in cirrhotic patients. Despite the different imaging modalities and novel contrast media making it possible to do a multiparametric evaluation of liver lesions, a confident characterization may still represent a challenge even for an expert liver imager and, in some cases, a biopsy is still required to reach a final diagnosis. Hybrid imaging with PET/CT and PET/MR may lead to new answers with the potential to determine liver lesion choline and glucose metabolism; but whether this will have a clinical impact on patient management is yet to be determined. Furlan A, Marin D, Agnello F, et al. 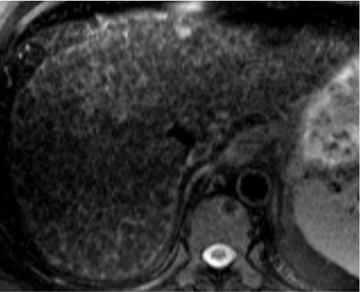 Hepatocellular carcinoma presenting at contrast-enhanced multi-detector-row computed tomography or gadolinium-enhanced magnetic resonance imaging as a small (</=2 cm), indeterminate nodule: Growth rate and optimal time for imaging follow-up. J Comput Assist Tomogr. 2012;36:20-25. Addley HC, Griffin N, Shaw AS, et al. Accuracy of hepatocellular carcinoma detection on multidetector CT in a transplant liver population with explant liver correlation. Clin Radiol. 2011;66:349-356. Anis M, Irshad A. Imaging of hepatocellular carcinoma: Practical guide to differential diagnosis. Clin Liver Dis. 2011;15:335-352, vii-x. Matsui O. Imaging of multistep human hepatocarcinogenesis by CT during intra-arterial contrast injection. Intervirology. 2004;47:271-276. Choi BI. Hepatocarcinogenesis in liver cirrhosis: Imaging diagnosis. J Korean Med Sci. 1998;13:103-116. European Association for the Study of the Liver et al. Clinical Practice Guidelines: Management of hepatitis C virus infection. J Hepatol. 2011;55:245-264. Tan CH, Low SC, Thng CH. APASL and AASLD Consensus guidelines on imaging diagnosis of hepatocellular carcinoma: A Review. Int J Hepatol. 2011; article ID 519783. Ayuso C, Rimola J, Garcia-Criado A. Imaging of HCC. Abdom Imaging. 2012;37:215-30. Kim TK, Lee KH, Khalili K, Jang HJ. 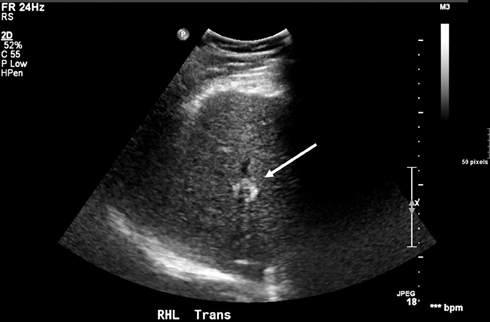 Hepatocellular nodules in liver cirrhosis: Contrast-enhanced ultrasound. Abdom Imaging. 2011;36:244-263. Khalili K, Kim TK, Jang HJ, et al. Indeterminate 1-2-cm nodules found on hepatocellular carcinoma surveillance: Biopsy for all, some, or none? Hepatology. 2011;54:2048-2054. Serste T, Barrau V, Ozenne V, et al. Accuracy and disagreement of CT and MRI for the diagnosis of small hepatocellular carcinoma and dysplastic nodules: Role of biopsy. Hepatology. 2012;55:800-806. 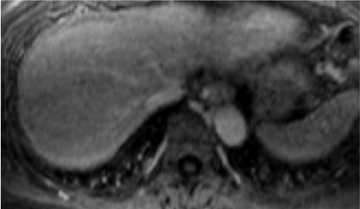 Lomas DJ, Mannelli L. Hepatobiliary MRI. In: Harris RK, Wasylishen R, eds. Encyclopedia of magnetic resonance. New York, NY: Wiley InterScience; 2011;1-13. Mannelli L, Godfrey E, Graves MJ, et al. Magnetic resonance elastography: Feasibility of liver stiffness measurements in healthy volunteers at 3T. Clin Radiol. 2012;67:258-262. Rosenkrantz AB, Mannelli L, Mossa D, Babb JS. 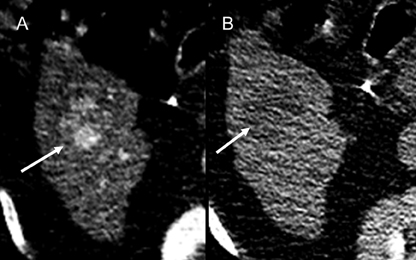 Breath-hold T2-weighted MRI of the liver at 3T using the BLADE technique: Impact upon image quality and lesion detection. Clin Radiol. 2011;66:426-433. Mannelli L, Godfrey E, Joubert I, et al. 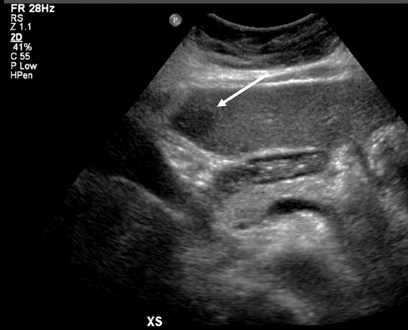 MR elastography: Spleen stiffness measurements in healthy volunteers—preliminary experience. AJR Am J Roentgenol. 2010;195:387-392. Chung S, Breton E, Mannelli L, Axel L. Liver stiffness assessment by tagged MRI of cardiac-induced liver motion. Magn Reson Med. 2011;65:949-955. Rosenkrantz AB, Mannelli L, Kim S, Babb JS. 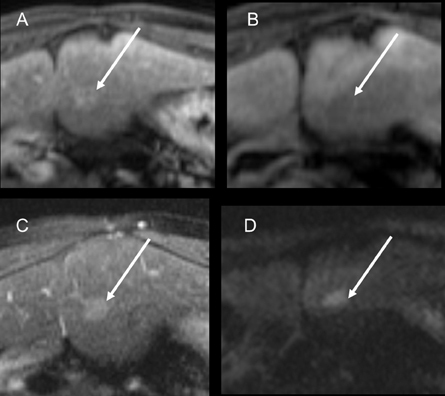 Gadolinium-enhanced liver magnetic resonance imaging using a 2-point Dixon fat-water separation technique: Impact upon image quality and lesion detection. J Comput Assist Tomogr. 2011;35:96-101. Lee JM, Choi BI. Hepatocellular nodules in liver cirrhosis: MR evaluation. Abdom Imaging. 2011;36:282-289. Lee JM. Imaging of hepatocellular carcinoma. Cancer Imaging. 2011;11:S72. Lee JM, Trevisani F, Vilgrain V, Wald C. Imaging diagnosis and staging of hepatocellular carcinoma. Liver Transpl. 2011;17 Suppl 2:S34-S43. Kim S, Mannelli L, Hajdu CH, et al. Hepatocellular carcinoma: Assessment of response to transarterial chemoembolization with image subtraction. J Magn Reson Imaging. 2010;31:348-355. El-Serag HB, Kramer JR, Chen GJ, et al. Effectiveness of AFP and ultrasound tests on hepatocellular carcinoma mortality in HCV-infected patients in the USA. Gut. 2011;60: 992-997. Colagrande S, Belli G, Politi LS, et al. The influence of diffusion- and relaxation-related factors on signal intensity: An introductive guide to magnetic resonance diffusion-weighted imaging studies. J Comput Assist Tomogr. 2008;32:463-474. Mannelli L, Hoang MV, Sabath AP, Linnau KF. An unusual oral mass. Gastroenterology. 2012;142:e14-15. Hardie AD, Naik M, Hecht EM, et al. Diagnosis of liver metastases: Value of diffusion-weighted MRI compared with gadolinium-enhanced MRI. Eur Radiol. 2010;20:1431-1441. Willatt JM, Hussain HK, Adusumilli S, Marrero JA. MR Imaging of hepatocellular carcinoma in the cirrhotic liver: Challenges and controversies. Radiology. 2008;247:311-330. Lencioni R, Crocetti L. Local-regional treatment of hepatocellular carcinoma. Radiology. 2012;262:43-58. Fleig WE. Hepatocellular carcinoma: local-regional treatment. Dtsch Med Wochenschr. 2003;128 Suppl 2:S102-103. Mannelli L, Patterson AJ, Zahra M, et al. Evaluation of nonenhancing tumor fraction assessed by dynamic contrast-enhanced MRI subtraction as a predictor of decrease in tumor volume in response to chemoradiotherapy in advanced cervical cancer. AJR Am J Roentgenol. 2010;195:524-527. Mannelli L, Kim S, Hajdu CH, et al. 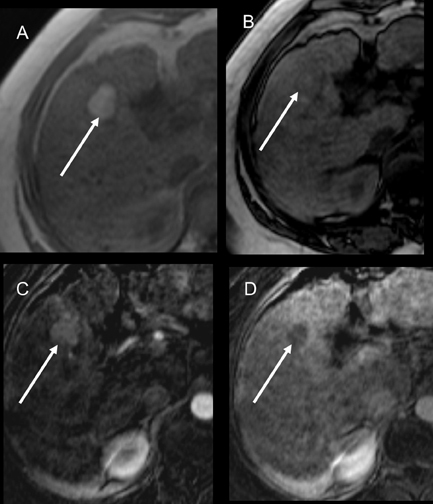 Assessment of tumor necrosis of hepatocellular carcinoma after chemoembolization: Diffusion-weighted and contrast-enhanced MRI with histopathologic correlation of the explanted liver. AJR Am J Roentgenol. 2009;193:1044-1052. Focal lesions in the cirrhotic liver. Appl Radiol. Dr. Mannelli is in the Department of Radiology, University of Washington, Seattle, WA, and Dr. Rosenkrantz is in the Department of Radiology, New York University Langone Medical Center, New York, NY.